Winter in Minnesota with no indoor arena is not very conducive to riding and training. During November, December and early January, I normally give the horses a break. After the busy lesson season, they appreciate a couple months of just being a horse. But by the end of January/early February, I start to do some basic ground exercises with them to get them back in the working mindset. One of my favorite things to teach a horse is how to lower their head. This makes working with the horse’s halter and bridle much easier. Teaching your horse to lower their head is also a wonderful calming exercise as horses typically stand this way when they are relaxed. To train, simply stand beside your horse. Gently pull down on the lead rope. As soon as you feel your horse give, even slightly, release all pressure on the rope. Relax for a bit as a reward and then try again. Normally they catch on pretty quickly! 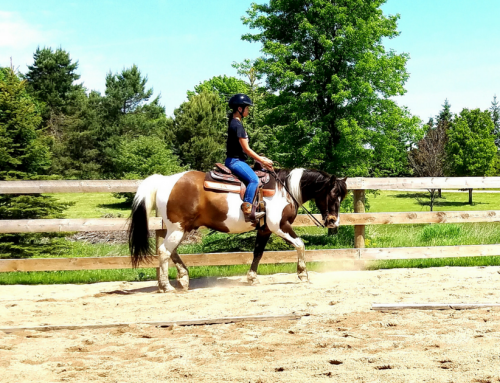 Back-up is one of the most important things you can teach your horse. I like to have a horse that softly and willingly backs up on the ground and under saddle. To start training a solid backup on the ground, face your horse and take a look at his head. If it is high, start by asking him to lower it (exercise #1). When his head is in a relaxed position. Put slight pressure on the lead rope and take a step towards him. As soon as he takes a single step back, release. Repeat this process until you can ask for multiple steps at a time. The final thing I like to work on with my horses is flexing. Essentially I want the horse to yield to pressure. This becomes very important when I start working under saddle. To work this skill on the ground, stand at the horse’s side just behind their withers (where you would be sitting if you were riding). Hold the lead rope up near the horse’s withers and pick up the slack so there is tension in the rope. As soon as you feel your horse give his nose towards you, reward with a release. I don’t look for a dramatic bend in my horse’s neck, I just want him to softly give his face side to side when I ask. NOTE: With all of these exercises the release is very important! At the beginning, reward your horse for the slightest try. Remember, the goal is willingness and softness. If you horse does the exercise but is stiff and resistant, then the whole point has been missed. Go outside and test your horse. Can he or she do these three exercises? If you have a soft, finished horse, this should be a piece of cake! If your horse is struggling with these, I encourage you to work at them a little bit each day. As you keep practicing you will see improvement!